Director/producer David G. Evans’ latest film, Indivisible, is out on home video on Tuesday, January 29. In this feature, Evans discussed his previous film, The Grace Card with me. This inspiring drama opened in theaters in February 2011 and stars Michael Joiner and Michael Winterbottom as two police officers in an unlikely partnership as Mac who deals with a past family tragedy and Sam Wright who helps him through faith in God and forgiveness. Academy Award-winning actor Louis Gossett, Jr. co-stars. An optician, Evans directed this drama in 30 days using a budget of only approximately $200,000 and produced the film with his wife Esther through GraceWorks Pictures and Calvary Pictures. Evans also has background directing Calvary Church’s large-scale musical passion plays and manages his eye practice in Memphis, Tennessee, where The Grace Card was filmed. Are there unique ways that your education/medical skills have helped you in filmmaking? I guess, to a very limited degree, it allowed me to make contacts in the community. One example was a clinic next door to the hospital. The president and vice president were 15 years in that practice. When I knew I needed a hospital for filming; I gave a five-minute presentation to those folks. Because the movie was not geared toward my medical profession, my experience did not play a big role. I was in optometry school for four years, but my passion play experience led my down the path for this film. Additional details tie in with this journey, but just having those community contacts helped most. One of my patients, Sam, was the inspiration for the Sam Wright character. It led me into the beginning of the project. How my film making journey started God and asking Him “What journey do you want us to tell.” That’s how it started. This film tackles several real issues like family dynamics, personal loss and prejudice while showing how people grapple with them on a very personal level. The last five minutes of the movie expanded from the original ending. You don’t see it coming. It allows the tears to pour out. Mac experiences ultimate forgiveness. When we filmed that scene for first time there were 200 people as extras who had no idea what they were about to see! We had no idea if Michael Joiner could cry. I cast him with no reading or audition. His look was perfect for the movie. When it came time to shoot that scene I thought God let this scene come together the way it’s supposed to. Everyone applauded when Mac experienced intense forgiveness. I intended to stop, but the experience extended the ending beyond what we expected. I said “Keep the cameras rolling.” It changed the whole movie. It was something that couldn’t be scripted. It’s all the more special when we watch it now. God was in control and brought it together. How did you approach your actors on hitting the right emotion during intense scenes and important messages? Louis Gossett, Jr. nailed it every time. Working for amateur actors helped me prepare. Making a film was lower stress level versus the live stage. It was such a thrill. The digital technology was great. We used a “red camera,” which helped to match real film. It was hard for me as an inexperienced filmmaker to tell the difference. It looks just like film. Now on a more limited budget, you can come up with a product that you couldn’t do years ago. Casting involved over 50 churches, so we saw many people over many days. It was great knowing we were all there for the same reason, which created an amazingly relaxed atmosphere. We were not nervous. We would begin every day in prayer and a devotional. This is a Christian set that had ground rules that were not broken on set. The overall purpose was bringing people into God’s kingdom. We had a police lieutenant on set every day. 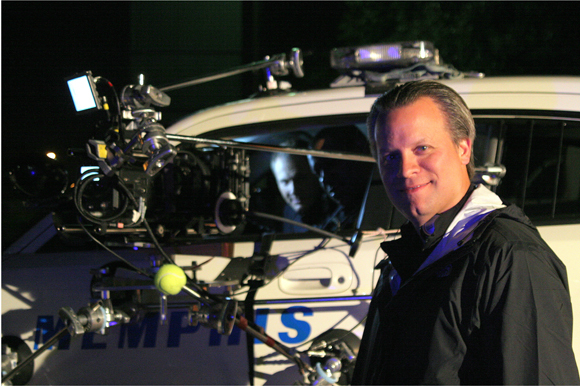 The police department consulted with us and insured accuracy throughout filming to create a realistic portrayal on the streets of Memphis today. Describe the collaboration different groups throughout production. When you’re doing aerial shots in a city scene or anything by helicopter, it can cost as much as $10,000 to $12,000 a day, but a local company called Hospital Wing helped us. They help rescue crash victims and perform other emergency services. We needed a “med vac” helicopter when during a key sequence involving Mac and his son, so we approached the Hospital Wing CEO who graciously gave us whatever we needed. He even got a camera mount brought in for our use, so we were able to get some amazing aerial shots. The production value went up greatly at no extra cost. This group and many other approached us basically saying “I’m here if you can use me”. Being able to film in real police equipment was amazing. We also geared the music after Brent Rowan, a guitarist who has released numerous albums and has his own studio. He told us he had wanted to help with a film musical score for many years. He was able to craft a number of tracks that really gave us that southern draw we were looking for. Describe your collaboration with cast, crew and volunteers to organize the film. A local resident in Memphis was also an assistant director who helped us. I got great assistance moving from the amateur stage work in my ministry to working with professionals who make films for a living. It gave the project immediate boosts and higher quality. It gave us a better sense of how it’s really done. We would adjust the schedule and open our eyes to others things. The order of scenes was key. What shots we needed on certain days. Scheduling the proper times for breaks for the cast and crew. It was a unique combination of Hollywood veterans and church people who never made movie. Howard Klausner he took my original screenplay and did a page one rewrite where he enhanced everything after reading through it from beginning to end. It gave us something that would feel more natural. It was really incredible. Different people from every walk of life offered help. Some people even came from out of state asking to be part of crew. They stayed in extended stay hotels just to be part of this film. It was an inspiring filmmaking experience. What was the film’s premiere like for you? A couple of days before movie opened, we enjoyed the premiere at the Orpheum Theatre here in Memphis. The city police department pulled out all stops. Honor guard. Horses. Formations. Motorcycle units. It was a beautiful night. Gloria Estefan allowed to use one of her Spanish songs, so her and her husband Emilio came to the premiere. It was a great night of unity. For the first time everyone could see the end result and the tears that were shed. Overall we logged more than 15,000 volunteer hours. You don’t get volunteers like that on a Hollywood movie. There were life changing impacts from this film. For us, we’re just thankful. We had no idea would be in theaters and we got such a quick contact from people wanting to distribute the film. Are you planning any future projects? We have a few different story lines. Within the next six months we should know direction to go as we continue our ministry and inspire others to the same. This entry was posted in 2010s Film Reviews and tagged David G. Evans, director, Film, Indivisible, interview feature, movies, Tall Writer, The Grace Card. Bookmark the permalink.